At work today I was starving, but I just didn’t want my whey protein shake. I knew I was going home in two hours, so instead, I snacked on the rest of my raw walnuts about 1/4 cup to tide me over until. 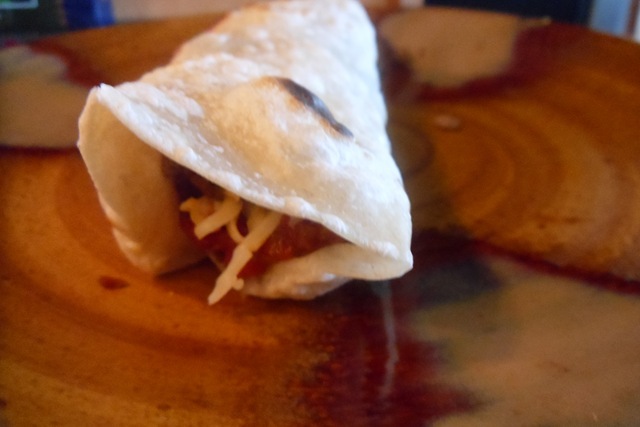 Once home, I heated up the remaining organic grass fed ground beef and made a taco with natural pepper jack cheese and organic spicy salsa. It totally beat the boring but easy whey protein shake that was sitting in my lunch box at work. Not the prettiest food pics, but it sure tasted good. The H and I decided not to exchange Christmas gifts this year or birthday gifts since we are getting a puppy. We figured we are spending a lot of money on the little guy, so instead of spending even more money on gifts, we would just save instead. Somewhere between October 20th (The Husband’s birthday) and December 1st, the Husband had convinced me that he needed a Play station 3. He is such a great guy so I agreed. I figured if he is playing his games, I could read more magazines, do more yoga, run more errands, cook more new recipes, spend more time chatting on the phone with friends and family and blog more in general! I look at it as a win-win situation! Once I agreed to the PS3, he tried convincing me he needed a new TV as well, for his man cave that doesn’t exist. I had to put my foot down somewhere! 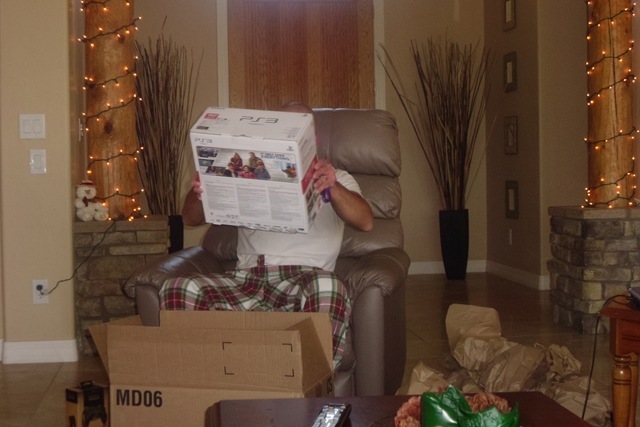 Here are a few pics of the Husband opening his new toy! We love our flannel pants in this house! While the Husband got into his new toy, I did some Barkan Yoga in our bedroom with the heat cranked. Namaste! Ingredients- any type of vegetable you have on hand. 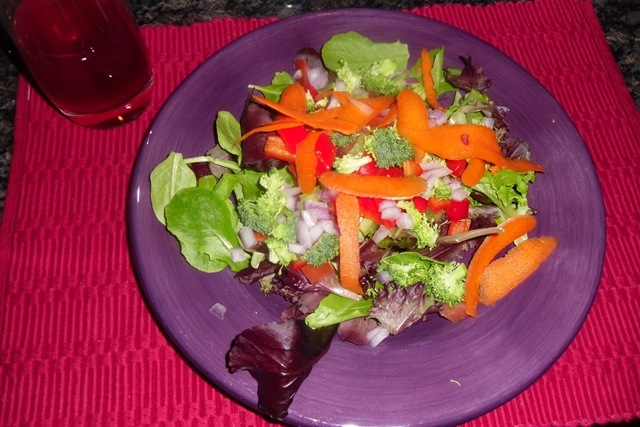 We used, spring mix, broccoli, red bell pepper, shredded carrot, red onion, celery and tomato (all organic). 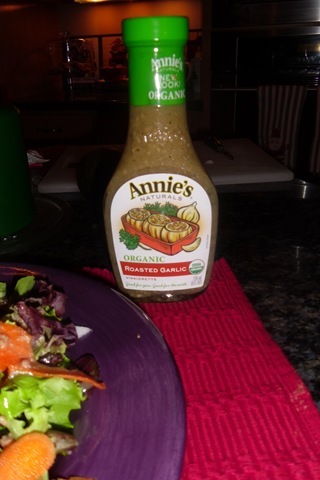 Topped with Annie’s Roasted Garlic Dressing. I was still a little full from lunch so I skipped the chicken. 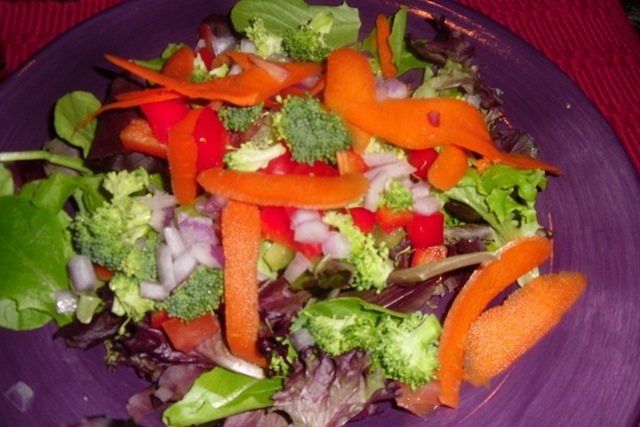 Question: What is your favorite salad topping? I would have to say mine is red onion! Boys and their play stations. I get bored after about 20 minutes when they can play all day and into the night. They are so weird. 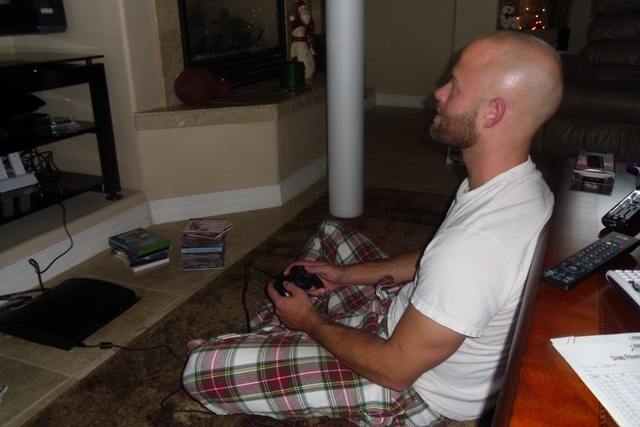 I get bored right away too, unless it is Mario, then I like to play a little! 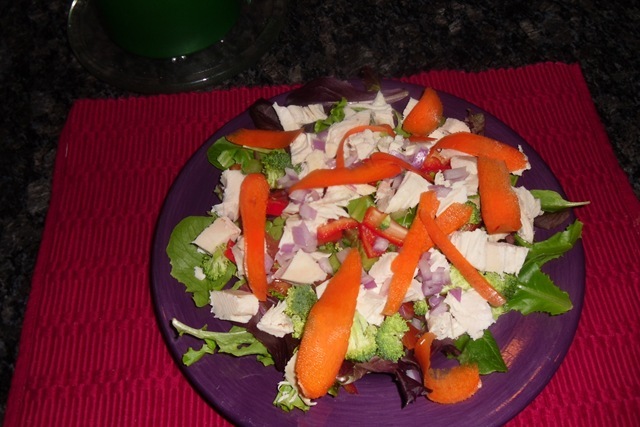 I love feta on salads…mmm..and toasted almonds! I love toasted almonds on salads too! The whey protein shakes or green smoothies? The whey protein and water keeps me full for a few hours. I usually drink it at 1pm and then my 3-4pm have a snack before dinner. The green smoothie isn’t that filling, I think if I added in protein powder then it would stick with me longer. I always have an AM snack as well, usually an apple and almonds, but for the past two days I’ve been drinking the green smoothie as my AM snack since I’m trying to use up as much spinach as I can before it goes bad. 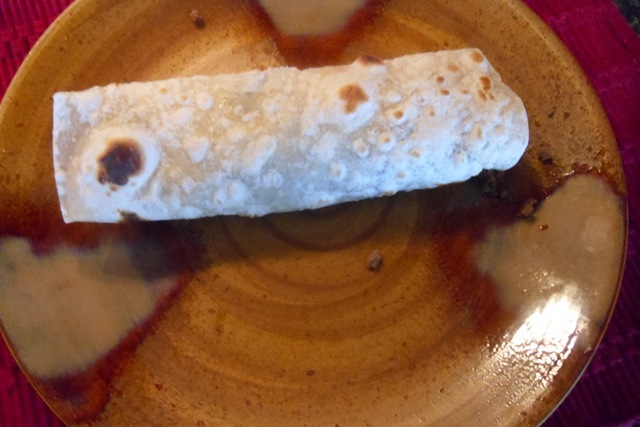 Usually I have protein on my salads at night, but since I had a huge grass fed beef burrito for a late lunch at 3:30pm, I wasn’t super hungry when dinner rolled around. what kind of whey protein do you like best? I have one (Gold’s I think?) that is pretty good but I’m sort of sick of it. Is that the one you like or a different one? I like Gold Standard Whey Protein (I get it at GNC). I like the chocolate flavor, I think this one really tastes good. There are around 120 calories for 20-25 grams a protein. I posted a picture of it in the blog entry below. Favorite salad topping is an extremely tough one. There are so many! Salad may be the best invention. Like, ever. Contenders: avocado (obviously), roasted tomatoes, roasted butternut squash/beets/chickpeas, goat cheese, grilled shrimp/corn/eggplant, jicama, candied pecans, cranberries, ok seriously. Too hard a question. Can you tell me what the Barkan yoga dvd is that you have (and where you purchased)? I am looking for something like Bikram on DVD to do at home, and this method sounds like it might be the closest. Thoughts? 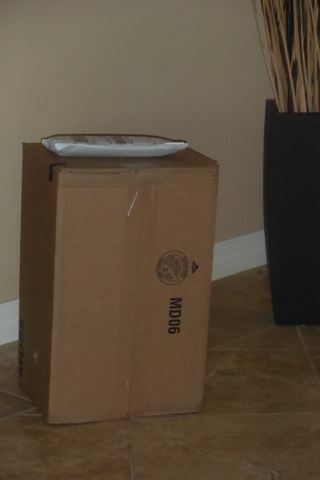 I ordered it from Amazon last year. I put the link below. I used to be a HUGE Bikram fan and started back in 2003. When I moved to Northern Arizona, I couldn’t find a Bikram and or a hot yoga studio anywhere so I searched online and found the Barkan method. I think James Barkan, who developed The Barkan Method used to study under Bikram and developed his program based off Bikram. There are a lot of similarities. The yoga DVD is only for an hour instead of 90 minutes like in Bikram. As for doing hot yoga at home, I usually turn the heat up to 70 or 72 and have been contemplating turning on a space heater besides my mat as well. I really like this DVD and think it is a great alternative. You can read lots of reviews at the Amazon site as well! I hope this helps! Yay for boys and their toys! lol My favorite salad topping would either be avocado, feta cheese or tuna!! Yum yum. There is also nothing better than a good dressing, those can MAKE the salad!